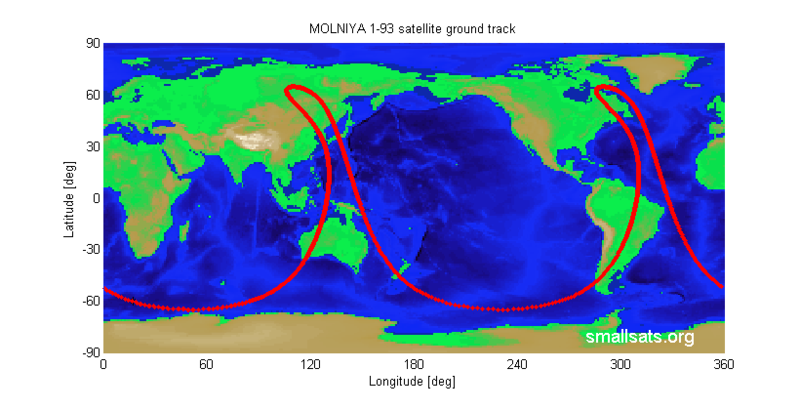 Molniya satellite systems were military communications satellites used by the Soviet Union. The satellites used highly eccentric elliptical orbits of 63.4 degrees inclination and orbital period of about 12 hours. This type of orbits allowed satellites to be visible to polar regions for long periods. In this example we will show how to plot ground track for satellites. By smallsat in Featured, Space Flight/Orbital Mechanics on January 20, 2013 . What is the function R2RA_Dec(R)? No ground track lines .How do you fix this? Did you have the R2RA_Dec(R) code as well ? see the comments above and link to it. If you still have a problem mail me either using form email me the errors you get with the project help form. If they are not available in MatLab library, can you send those code? Manohar, You can also send me an email (look contacts) and i can sent files to you. I sent all files that you need. Good Luck ! Sorry i just noticed this. The code is in Matlab. If you just copy the code from here to the Matlab source file and run it it will do the job. yeap you just need to provide the correct satellite orbital parameters and thats it. You could also provide a TLE file.. check my posts regarding TLE. I will also send you an email. if You will have more questions I’ll try to help you. Good Luck ! your full file? Thank you. Thats really strange. If u have all the functions required u shall get the same results. I will sent you my files when I get home. Thanks ! Okay, thanks! I will wait for your mail. would you let me know when I will be able to get file?? Oh!!! I solved it. My keplerEq function was wrong. I found correct code for it. Now i’m curious about ti,T,dt variables. What are they? How does dt can work as time step? Just in case I sent the files to your email . T is the orbital period. ti is initial time and knowing orbital state at ti you find the orbital state at ti + dt . if u use smaller dt you will get more points in ground track. hope it helps. I have the files keplerEq, Orbital2State and R2RA_Dec. please help! I would really appreciate if you could send me the files needed! which version of mat lab you used for this code? I am interested in some of the matlab codes you have mentioned. If I want to run them, how do I get the data file?